In 1966 Derry became organist and choirmaster of St. David’s Church in Merthyr; a position he held for 32 years. Ably assisted by Maureen, they built the choir to a size and standard that enabled them to sing major works from the choral repertoire including Messiah (Handel), The Creation (Haydn), Gloria (Vivaldi) and Requiem (Faure), as well as major anthems from the church repertoire. Such was the standard of the choir that they often sang the services in Llandaff Cathedral when the cathedral choir was on holiday. 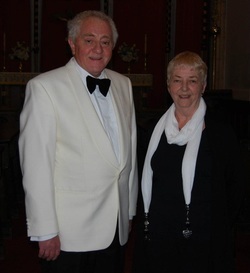 Maureen and Derry were always willing to help other choirs when they needed a conductor and accompanist. This included a week long tour of Germany with the Lindsey Singers and participation, with Dowlais Male Choir, in the Celtic Festival in Paris.